Hugh Garry: The greatest storytellers of our generation? The greatest storytellers of our generation? I've been thinking a lot recently about different ways of telling stories and where we can go with them given the wealth of tools we have at our disposal. Ever since cavemen chalked images on walls we've experimented with story telling tecniques that have taken the story from the walls to books to stage to the big screen etc. Earlier in the year the genius Hon brothers at SixToStart dropped We Tell Stories on the world. If you missed it We Tell Stories was a project for Penguin Books in which they explored how the 'interactivity, connectivity and immediacy of the internet can enhance and evolve storytelling'. It was superb, groundbreaking and a real eyeopener. Whilst Shakespeare, Tarantino and Dylan made the stage, screen and song their canvas Johnathan Harris is using the web to tell stories as well as any of the aforementioned Gods. From We Feel Fine to Universe, 10x10 to The Whale Hunt Johnathan's experiment with the new interface for storytelling makes him one of the greatest storytellers of our generation. Many of his projects comprise of feeds visualised in a beautiful way that allow the user to explore the variety of emotions raked in from blogs. Breaking from tradition with The Whale Hunt he swapped places with the computer by going out into the real world to collect the images himself. He joined a group of whale hunters in America's most northern point and documented the whole experience taking a photo every 5 minutes. 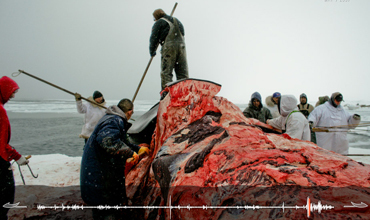 By increasing the frequency of photo's taken during the more frantic moments of The Whale Hunt, and displaying them like a medical heartbeat in a timeline, he has added tempo and tension as the dramatic events unfold in pictures. It's stunning! A theme of simplicity and emotion runs throughout his projects and tributes to his work such as Twistori strips his method down to the bones. So I started thinking about where the line is drawn between what is a story and a simple line of text? And when we look at ARG's I wonder where is the line between the story and the game? Are Lynetter's Flickr slides stories? No one tells stories about our brands better than our audience and with so many ways of interacting with them the challenge is how to take their 'stories', mash them with our content, then create something somewhere near as wonderful as the examples above. Answers on a Twitter to Radio 1 Interactive please.